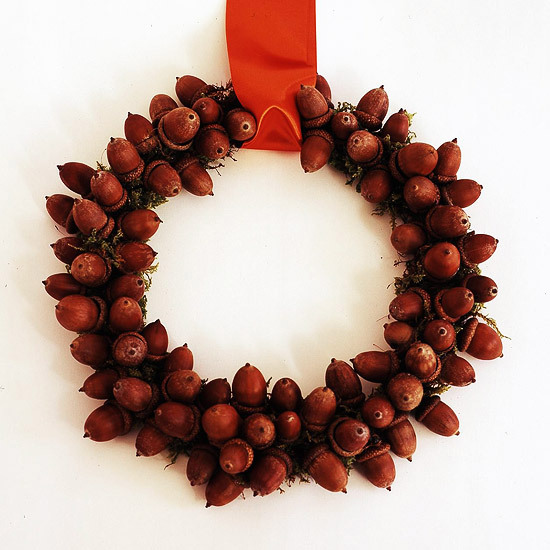 Acorn crafts make beautiful jewelry, gifts or fall-themed home decorations. With fall around the corner, why shouldn’t we make use of these tiny wonders? 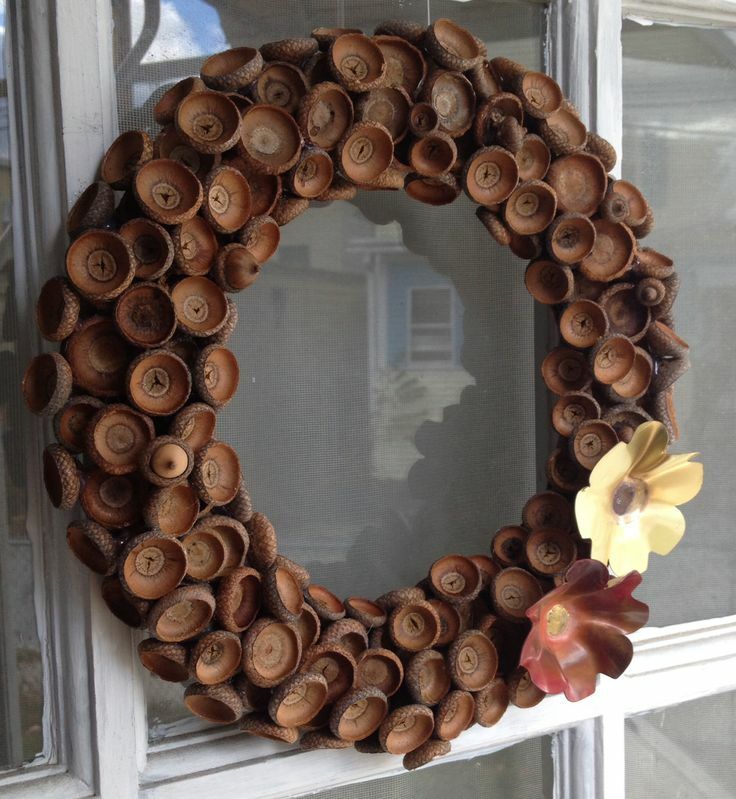 Fall crafts using acorns are timely. We compiled a list of 10 stunning acorn ornaments that you and your little ones will love. Channel your inner artistic spirit and bring these cute decorative projects to life. If you’re a regular on the DIY forums, blogs, and online communities, you probably have everything at hand already. Except for the acorns. Go on a treasure hunt by yourself or with your kids. They will love a stroll in the park or an outdoorsy weekend where picking up acorns is the most difficult chore of the day. Alternatively, you can try online shopping if you’re interested in buying bulk acorns for crafts, craft acorns’ caps, or just browse through the variety of acorns out there. The offers are quite good and the price tags are decent. However, you risk getting damaged goods. As such, we’re rooting for the first option. Get out and have fun under the fall sun and handpick top notch materials for your acorn crafts. Here’s what you can do with your treasure trove of acorns. A photo frame with wider sides. A hot glue gun & glue sticks. It’s really that easy to spruce up an old household item and have loads of fun while doing it. If there’s a need for a tutorial, here it is Acorn Photo Frame tutorial. You’ll notice there’s a difference between the way the acorns are glued in the tutorial and the acorn caps are glued in the image above. However, that is due to the fact that there’s really no rule to it. Let your creativity guide you. Add layers and layers of acorns in the clear glass container. 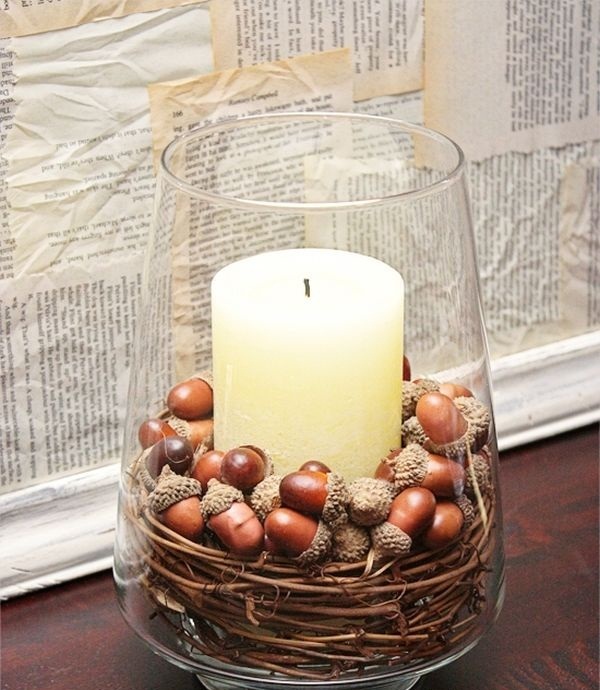 These cute natural decorative elements act as a stable base for the candle while adding a lovely rustic fall accent. 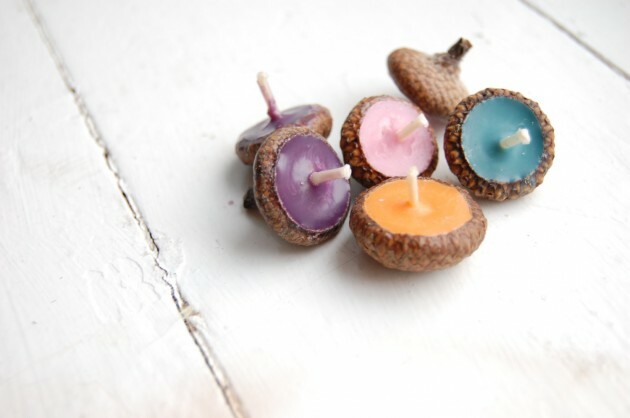 Melt the wax, pour it carefully in the acorn caps lined on a protective surface and let them dry. Here’s a quick and informative tutorial for these floating acorn candles. This is one of the easiest acorn crafts around. Nevertheless, it makes an extraordinary impression as a home decoration, a table centerpiece or a fall garden ornament. Throw them in a glass vase, use them for the votive candle support, create gilded acorns garlands or simply scatter them around on a tabletop. These acorn Christmas ornaments have the power to transform your home. Learn how to paint acorns with this short tutorial. You don’t have to fork out any pennies for store-bought fall décor when nature puts everything at your disposal. Ask your little ones for help with such acorn crafts. 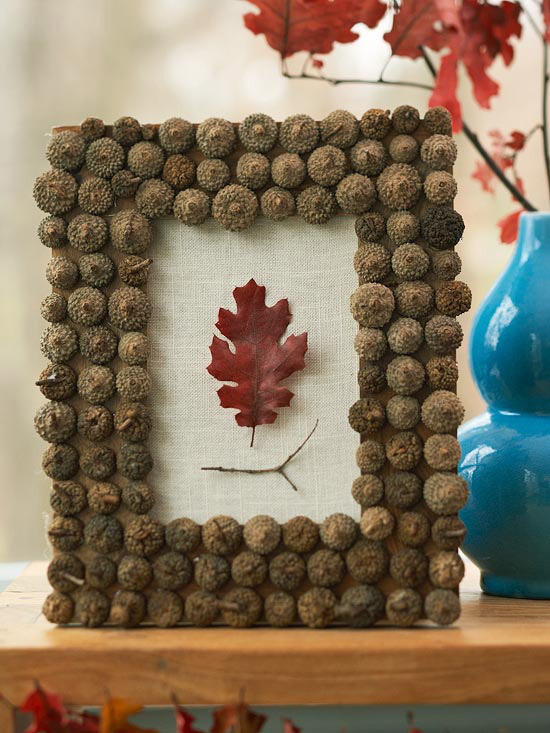 Let your creativity guide your designs and involve the kids in these acorn craft projects. They’re easy to make and entirely safe. Candle displays brighten up the home and complete a warm homey atmosphere. If you happen to have some acorn caps which don’t match any acorn bodies, use faux pearls to create the body of the acorn. This adds a touch of glam and softness to your home decor. 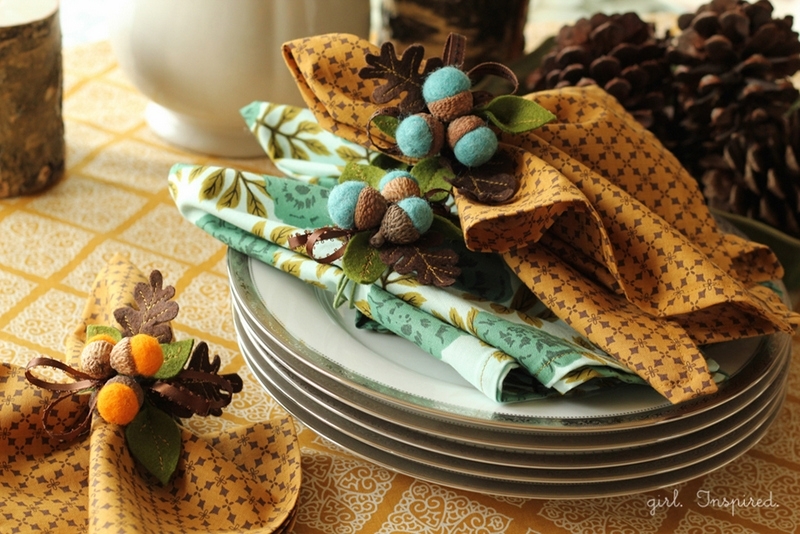 These acorn napkin rings are a great acorn crafts for kids idea, albeit more complex. The full tutorial will guide your steps through the process. Tiny acorn buddies, fairies or people make ideal acorn crafts for preschoolers and kids of all ages. Give it a try. Place the mythical acorn creatures in the garden or around the home for a dash of magic. 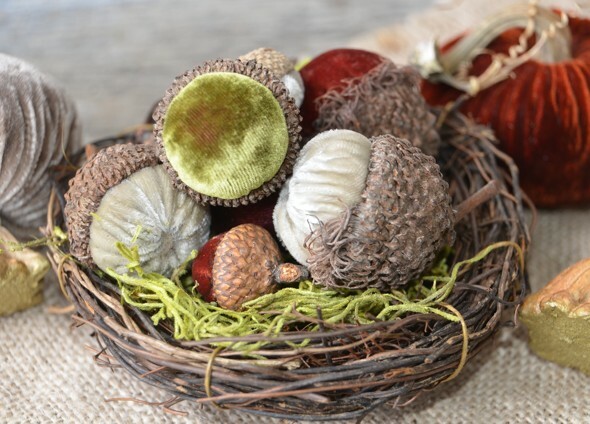 Acorn crafts are some of the most inexpensive ways to get stunning home decor inspired by the colorful fall. Moreover, cute thoughtful gifts for your loved ones are just a stroll in the park away. Give acorn crafts a try. We promise you’ll love the results. Not to mention that your little ones adore tagging along.